Located in the northwest of the island, right by the Gulf of Palermo in the Tyrrhenian Sea, Palermo is renowned for its history, culture, architecture and gastronomy, playing an important role throughout much of its existence. It is over 2,700 years old, founded by the Phoenicians but named by the Greeks as Panormus meaning ‘always fit for landing in. Palermo became part of the Roman Empire and of the Byzantine Empire for over a thousand years. From 827 to 1071 it was under the Arab rule when it first became a capital. The Arabs introduced many agricultural items which remain a mainstay of Sicilian cuisine. In 1072 Palermo returned to Christianity. It was under Roger II of Sicily that Norman holdings in Sicily were promoted into the Kingdom of Sicily ruled from Palermo as its capital, with the king’s court held at Norman Palace. The Kingdom of Sicily became one of the wealthiest states in Europe and much construction was undertaken during this period, such as the Cathedral. In 1194, Sicily fell under the control of the Holy Roman Empire and Palermo was the preferred city of the Emperor Frederick II, the Stupor Mundi. Palermo was then ruled by the Angevins, the Aragons, the Spaniards, the French and the Borbons, until the unification of Italy in 1861. The city tour includes its most important treasures: the Palatine Chapel with the splendid mosaics of Byzantine tradition and the Christ Pantocrator, the Arab-Norman Cathedral, the Oratorio of Santa Cita with its rich stuccoes by the Gagini, a unique masterpiece of the Baroque-style sculpture, the Opera Theatre, one of the most beautiful Opera Houses in Europe. The Cathedral of Monreale is considered one of the finest example of Norman architecture in Sicily, built by King William II. Living in the shadow of his grandfather Roger II – who inspired the building of the Cathedral in Cefalù and the Palatine Chapel – William was determined his cathedral should be the best. Its walls are entirely decorated by a splendid series of golden mosaics which constitutes the most complete cycle in the Byzantine tradition with its majestic figure of Christ Pantocrator. 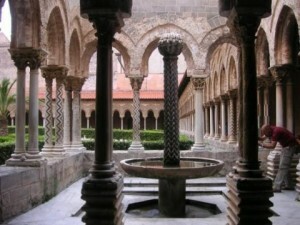 The nearby cloister is worth a visit as it illustrate William’s love for Arab artistry. Its courtyard its pure Orientalism with elegant Romanesque arches supported by columns decorated by shimmering mosaic patterns. Each capital is different and for that they represent a unique sculptural record of medieval Sicily. Palermo is renowned for its history, culture, architecture and gastronomy, playing an important role throughout much of its existence. Our exploration starts from the fascinating Capuchin Catacombs. The Catacombs outgrew their original cemetery in the 16th century and monks began to excavate the crypts below it. The bodies were dehydrated on the racks of ceramic pipes in the catacombs and sometimes later washed with vinegar. Monks were preserved with their everyday clothing and sometimes with ropes they worn as a penance. The catacombs contain about 8000 mummies that line the walls. Halls are divided into categories: men, women, virgins, children, priests, monks and professionals. An orientation tour of the city will follow including Piazza Pretoria and Via Maqueda whose “four corners” converge Palermo at a quartet of Baroque palaces left over from the heyday of the Spanish rule dating from 1560. Palermo is renowned for its history, culture, architecture and gastronomy, playing an important role throughout much of its existence. Its melting pot of Byzantine, Arab, Norman, Renaissance and baroque architecture is a fest for the eyes. Its museums are varied and include Palazzo Mirto and Palazzo Abatellis. Palazzo Mirto is located just off Piazza Marina and is one of the several noble palazzi offered by the city, but only a few are open to the public. Once home of one of the most important noble Palermitani families it has been converted into a museum in 1982 when the last heir of the Filangeri family decided to donate it to the Regional Government to be open to the public. It offers unique collections of furniture, paintings, ceramics, watches, weapons but most of all it offers the unique opportunity to see how really was the life of a noble and rich Palermitani family. Its walls are covered in acres of silk and velvet wall paper and vast embroidered wall hangings, while its floors are paved in coloured marbles and mosaics. The real extravagance, however, is the tiny Salottino Cinese (Chinese salon) full of black jacquer, silken wallpaper and a rather conceited ceiling painting of European aristos viewing the room from above. Proceed to the amazing Palazzo Abatellis, the Regional Art Gallery. The Palace is one of the most significant Gothic-Catalan architectonic samples in Western Sicily. Its gallery features sculptures and paintings from the 12th to the 18th century. 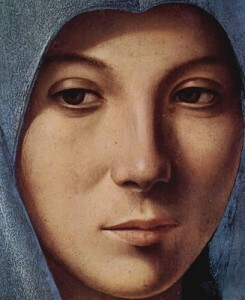 The Annunciata by Antonello da Messina is the highlight. An orientation tour of the city is included. Located in the northwest of the island, right by the Gulf of Palermo in the Tyrrhenian Sea, Palermo is renowned for its history, culture, architecture and gastronomy, playing an important role throughout much of its existence. Among the many beautiful churches, religious travelers and catholic devotees may decide to visit the Sanctuary of St Rosalia, located on Mt Pellegrino and dedicated to the patron saint. Born to nobility, Rosalia chose the life of a hermit and died in a cave in 1166 without anyone knowing. While Palermo was being ravished by the plague in 1624, St Rosalia appeared to a hunter, instructed him to retrieve her bones and parade them through Palermo. Upon doing so, the plague ended and St Rosalia has been celebrated as the patron saint of Palermo ever since. A scenic drive through the Favorita Royal Park, established as a hunting reserve by King Ferdinand I will led you to Mondello one of the most attractive beaches on the islands. You may choose to indulge at a local restaurant for lunch. An orientation tour of the capital of Sicily is included. Located in the northwestern part of Sicily, Segesta was the political center of the Elymian people, one of the three indigenous peoples of Sicilty, and in eternal conflict with Selinus the modern Selinunte. The ruins of the city are located on the top of Monte Barbaro at 305m above sea level. The hilltop offers a view over the valley towards the Gulf of Castellamare. Current archaeological work indicates that the site was later occupied by a Muslim community in the Norman period. Excavations have unearthed a Muslim necropolis and a mosque from the 12th century next to a Norman castle. Evidence suggests that the mosque was destroyed after the arrival of a new Christian overlord at the beginning of the 13th century. The city appears to have been finally abandoned by the second half of the 13th century. On a hill just outside the site of the ancient city of Segesta lies an unusually well preserved Doric temple built sometime in the late 5th century BC circa. On the opposite hill, at about 440 mt above sea level, is place the Theatre. Despite Segesta was not a Greek town, the theatre has a Greek style. Built to host 3000 people, it is still used of summer performance. The Elymians settled also in Erice, an important religious site associated with goddesses of fertility, located on top of Mount Erice, at around 750m above sea level, overlooking the city of Trapani, the low western coast towards Marsala, the dramatic Punta del Saraceno and Capo San Vito to the north-east, and the Aegadian Islands, providing all around spectacular views. It was destroyed in the First Punic War by the Carthaginians and from then on declined in importance. 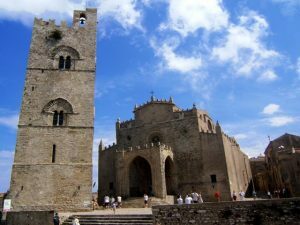 Erice was ruled by Arabs over 3 centuries until Norman conquest in 1167. Nowadays, Erice is one of the most well-preserved medieval towns in Sicily with much of its character intact. Wander through its ancient streets and visit some of the most famous homemade pastry shops, world-known for marzipan candies and other delicacies such as almond and pistachio pastries. Selinunte was the most westerly of the Greek colonies in Sicily, and for this reason was early brought into contact and collision with the Carthaginians and the native Sicilians in the west and northwest of the island. The former people, however, do not at first seem to have offered any obstacle to their progress; but as early as 580 BCE the Selinuntines engaged in hostilities with the people of Segesta, a non-Hellenic city, whose territory bordered on their own. The archaeological park of Selinunte is one of the most impressive of the ancient Greek world. The city was forgotten until the middle of the 16th century when a Dominican monk identified its location. Excavation began in 1823 thanks to two English archaeologists. The site is divided into the acropolis, the ancient city, the eastern temples and the Sanctuary of Malophoros, spreading over a vast area over a hill, one of the largest in the world. Built around a baglio (manon house), Scopello is a tiny two-streets-and-a-square hamlet which enjoys a unique atmosphere of the past and a gorgeous view over the tonnara (tuna processing plant) and the sea and the Scopello stacks. 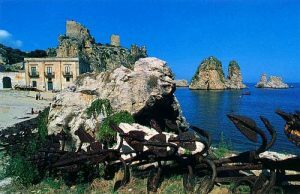 The tonnara is surrounded by rows of old anchors and by waters of an incredible blue and was one of the fascinating set of Ocean’s Twelve. Thanks to the 2006 America’s cup, the beautiful Baroque historical centre of Trapani has been restored and the town now lives a sort of second childhood. Erice is one of the most well-preserved medieval towns in Sicily with much of its character intact. Wander through its ancient streets and visit some of the most famous homemade pastry shops, world-known for marzipan candies and other delicacies such as almond and pistachio pastries. Founded by the Elymians Erice was an important religious site associated with goddesses of fertility. It is located on top of Mount Erice, at around 750m above sea level, overlooking the city of Trapani, the low western coast towards Marsala, the dramatic Punta del Saraceno and Capo San Vito to the north-east, and the Aegadian Islands, providing all around spectacular views. It was destroyed in the First Punic War by the Carthaginians and from then on declined in importance. Erice was ruled by Arabs over 3 centuries until the Norman conquest in 1167. One of the three chief Phoenician settlements in Sicily with Mothia and Palermo, Solunto is located on a promontory with a splendid view over Capo Zafferano. Excavations have brought to light considerable remains of the ancient town, belonging entirely to the Roman period, and a good deal still remains unexplored. Cefalù is one of the major tourist attractions in the region, pretty and picturesque with its beautiful streets, squares and fantastic sandy beach. The town is famous for its Norman Cathedral, built in 1131 by Roger II, king of Sicily, in a style of Norman architecture which would be more accurately called Sicilian Romanesque. The exterior is well preserved, and is largely decorated with interlacing pointed arches and windows. In the interiors, the only mosaics preserved are those of the apse and the last bay of the choir; they are remarkably fine specimens of the Byzantine art of the period (1148) and the figure of the Pantocrator gracing the apse is especially noteworthy. 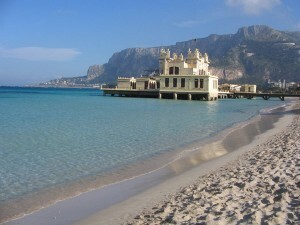 Thanks to its charming atmosphere, Cefalù was filmed in Guseppe Tornatore’s Cinema Paradiso. Despite the crowd during summertime and holiday periods, its gorgeous architecture and atmospheric streets make it a lovely spot to strolling around.